Lake Braddock Crew Spring Rowing Program | Go Bruins! Official High School Rowing Season! Spring rowing is the official rowing season for our crew team. 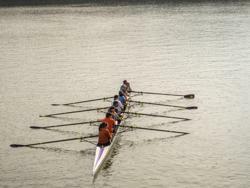 During spring rowing, our rowers practice on the water at Bull Run Marina after school every day. The season runs from late February to later May/June depending on your boat’s success. Don’t worry if you have never rowed before or didn't have the opportunity to row with us at Green Day's or Winter Conditioning, no experience is required to join crew. Crew is not a tryout sport per se, if you were on the team last year or are new to crew, you have to register, pass the swimming test, have an academic average of C or better, and pass your physical exam. Rowing is rewarding but is often ranked as one of the top 10 hardest sports in the world. Crew requires dedication not only of time but of self. It's a great way to meet new people and stay physically fit. Rowing provides a place and a home away from the stresses of everyday school life. The opportunity to be out on the water every day is unparalleled in all other school sports. Watch our rowers race down the river! Regatta: a sporting event consisting of a series of boat races! Regattas are where all of the sweat and dedication from the season is put on display. All of the effort during practice comes down to this one day; race day! Our regattas are organized by VASRA (Virginia Scholastic Rowing Association) and are held at the Sandy Run Marina. Lake Braddock Crew race against high schools in Fairfax County and in all of Virginia. The races are down a 1500m course on the Occoquan River. Regattas begin in March and are held on Saturdays until the end of May. For more information, check out our regatta FAQ , or if you want to see us in action, check out our social media profiles at popular sites such as Facebook and Shutterfly, links at the bottom of each BruinCrew.com page.